Each spring, summer, and fall, when the pollen starts to fly around, millions of people suffer from sneezing, coughing, itching, runny noses, and watering eyes. Seasonal allergies, also called pollen allergies, have symptoms that are worse during the aforementioned seasons. Plants produce the microscopic round or oval grains called pollen in order to reproduce. In some species, the plant uses the pollen from its own flowers to fertilize itself. The types of pollen that most commonly cause allergic reactions are produced by trees, grasses, and weeds that do not have flowers. These plants produce small, light, dry pollen granules that are custom-made for wind transport. Ragweed pollen has been known to travel 400 miles out at sea. Weeds are the most prolific producers of allergenic pollen in North America. The major culprit is ragweed. Some others of importance are sagebrush, redroot pigweed, lamb’s quarters and English plantain. 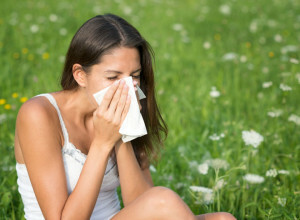 Of the than 1,000 species of grass in North America, only a small number produce highly allergenic pollen. These include Kentucky bluegrass, timothy grass, Johnson grass, redtop grass, orchard grass, Bermuda grass and sweet vernal grass. Allergenic pollen is also produced in trees such as oak, ash, elm, hickory, pecan, box elder, and mountain cedar. Pollen can trigger the allergic reaction that doctors call seasonal allergic rhinitis, or hay fever. 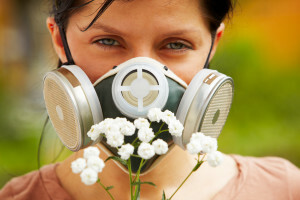 Pollen is one of the most pervasive of all allergens. Short of staying indoors when the pollen count is high, there is no easy way to avoid windborne pollen. But there are some ways to ease the symptoms of pollen allergies. The National Institute of Allergy and Infectious Diseases supports and conducts research on allergic diseases. The goals of this research are to improve the methods for diagnosing and treating allergic reactions, to provide a better understanding of the causes of allergy, and eventually to prevent them. 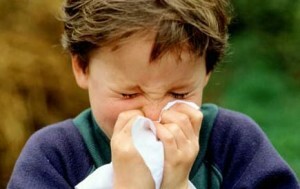 When one is exposed to an allergen, like ragweed pollen, it has the ability to trigger the immune system into action. A mast cell within the immune system releases a substance called histamine. This substance will attach itself to certain receptors in blood vessels and force them to enlarge. Histamine binds to other receptors as well, which will bring about swelling, itching, redness and changes in secretions. Antihistamines serve to prevent these symptoms from occurring by blocking histamine receptors. People born with allergies will be suffering from them for their entire lives. This is because, similar to its closely related counterpart, asthma; allergies have no long-term cure. There are many different types of medications available to the allergy sufferer, however. Over-the-counter and prescription drugs can be easily obtained in order to help the patient get some relief from some of the common symptoms of allergies like a runny nose, itchy and watery eyes, cough and congestion. Allergy drugs come in many shapes and sizes, including combination medicines, corticosteroids, antihistamines, decongestants and others. There are even some types of shots given to reduce allergy symptoms that are said to actually increase one’s ability to tolerate allergens gradually over a period of time. Antihistamines have been used for many years and can usually be taken as a liquid medicine, in pill form, nasal spray or eye drops. Over-the-counter nasal sprays can be used to treat seasonal or year-round allergy symptoms, and antihistamine eye drops can relieve itchy eyes. What Kinds of Dogs are good for People with Allergies?